I remember the first time I ever saw a painting by Julian Stanczak in person. It was at the Toledo Museum of Art, several years ago. Standing before And Then There Were Three, in all of its 4-foot-by-12-foot vastness, I literally felt myself being engulfed by the colors and forms before me. Green and red were banging against each other, forming a warm brown, vibrating against several rhythmic progressions of purples. And Then There Were Three by Julian Stanczak. 48 x 144 inches (122 cm x 3.7 m). 1971. Collection of Toledo Museum of Art. Photo by Faasdant via flickr. I remember trying to focus on just one color — training my eyes to carefully scan the canvas from bottom to top edge, in a vertical line — and noted how my perception of that singular color changed, based on its proximity to other colors. The more I gazed at And Then There Were Three, the more I fell into it, as if a gravitational pull had lured me into a radically different (and far more interesting) reality. I couldn’t pull myself away. I was in bliss. That moment at Toledo Museum of Art changed my thinking about art and how I saw my own art. Julian Stanczak had joined my personal constellation of art superstars. Ever since, I have followed the arc of Stanczak’s career with great interest. I have enjoyed the resurgence in interest in his work — as evidenced by his inclusion in the Optic Nerve, presented by Columbus Museum of Art in 2009, as well as CLE OP: Cleveland Op Art Pioneers, on view through February 26, 2012 at Cleveland Museum of Art. The fact that Stanczak is a Clevelander — he resides in Seven Hills, one suburb east of where I grew up (Hint: It rhymes with “pharma.”) — who attended Cleveland Institute of Art around the time my mother did (ca. 1950), makes him even cooler. Naturally, when Julie Karabenick, editor and curator of Geoform.net, contacted me last week to let me know that she had just posted an interview with Stanczak, I virtually flipped out. At first, I tried to read the interview on my phone, but quickly stopped once I realized how comprehensive it is. Clocking in at more than 15,000 words (23 pages of 10-point type, without images, expertly led and transcribed by Karabenick), this interview is a definitive, tour de force window into how Stanczak sees his work, his influences, and his creative process. Read the complete interview on Geoform.net here. As the interview progresses, Stanczak’s insights take on a gravity not unlike Paul Klee’s near-mystical observations in The Thinking Eye, but with a playfulness and optimism shared by Verner Panton. You intimately sense Stanczak’s love for color, and his deep interest in creating a visual sensation for the viewer, through interactions between colors. He speaks of his paintings as an “interactive fusion” of colors, where “visual elements lose their individuality for the sake of totality.” Stanczak’s canvases are surfaces upon which colors invite our eyes to mix them into entirely new colors, forming a “haze” or “glow” as they interact. Unlike anything else, the natural world has challenged and inspired Stanczak to experiment with colors, forms, and its many sensations. The artist expresses an instinctual fascination with the geometry and visual rhythms that permeate life. During his early teaching career in Cincinnati and Cleveland, in the late 1950s and early 1960s — a time of great isolation for the artist — nature was Stanczak’s one constant. At Yale one of the first lessons I heard from Albers was, “I cannot teach you your art!” Albers used destruction as a method of construction in his teaching. Anything you thought you knew was taken away. The principle was not to get attached to anything too early, but to keep looking, searching, and thinking. Albers made endless demands for you to be better, to be a more observant participant in life. You experienced total emancipation from what to do, how to do it and what to think. [Albers] gave me the courage to explore color beyond the classroom. He gave me the mindset to accept questions as part of life’s energy. My paintings and my search for understanding of color were based on a step-by-step process of observation. My observations might not match those of another person, but they became my foundation to build upon. I was gratified that Albers chose to include one of my pieces in his Interaction of Color portfolio. Albers emerges later in the interview, when Stanczak drove to New Haven to invite Albers to the opening of his first solo show in a New York gallery — Julian Stanczak: Optical Paintings, at Martha Jackson Gallery in 1964. The exhibition’s title unnerved Stanczak, but particularly rankled Albers. I found him aroused, pointing to the exhibition announcement in the paper. Without a greeting he said, ‘Your obligation is to correct that!’ I asked him what term he would use to describe the work, and he said ‘Perceptual painting.’ He was imperative about my responsibility to take action against something like this. I tried, but the term had already entered the public domain. Stanczak viewed his paintings as an opportunity for “perceptual experience,” not purely optical experience. The latter was, in his opinion, a matter of merely “registering visual actions blindly.” Pattern and illusion — eye-attacking art-making tactics, on their own — never motivated Stanczak the way they did so many of his contemporaries. Reading Karabenick’s interview is like a walk through time, spanning Stanczak’s life and the art currents surrounding and shaping him. The interview offers remarkable insights into one an artist’s lifelong approach toward color, form, and his highly individualistic art-making process — which undoubtedly has involved many miles of tape. I consider this interview a gift that will continue to unfold new meanings as I re-read and reflect upon it, in a way very similar to seeing Stanczak’s paintings in person, up close. It is a master class that any artist can attend, and I am thankful for the opportunity to have experienced it. I’ve been on a bit of a Bridget Riley kick lately. This happens every now and then. Something will start me thinking about Riley’s groundbreaking early op art work — how it completely dismantled the status quo in the early 60s — and how her work has steadily evolved over time. And so, I’ll check out books about Riley and read like a fiend, drawing inspiration with every turn of the page. 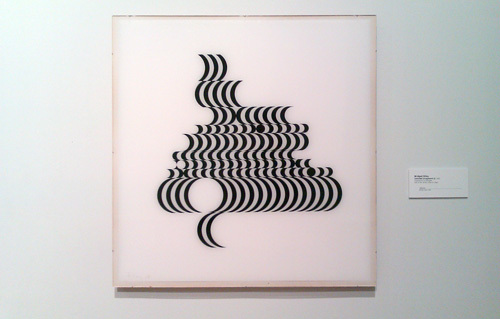 Bridget Riley’s Fragment 2/10, 1965, screenprint on Perspex. In England, Riley’s work is back in focus in a big way. Next week (beginning November 24 and continuing through May 22, 2011), the National Gallery will showcase her newest paintings in Bridget Riley: Paintings and Related Work. For the past year, Bridget Riley: Flashback, a retrospective, has been touring England; the exhibition is on view at Southampton City Art Gallery through December 5. Her early fragment series showed at Karsten Schubert in London over the summer. Likewise, a wealth of interviews with Riley are available online, thanks to BBC radio. A new Radio 4 production, Shimmer and Dazzle, Seeing What Bridget Riley Sees, previews the National Gallery exhibition (audio is online through November 23). Riley’s recollections in that piece overlap this interview with John Tusa. You can also catch these excerpts from a 1988 interview with Julian Spalding. While I appreciate Riley’s work on many levels, I respect her art historical sensibility and uncompromising commitment to making work her own way. When early fame had unfortunate consequences, Riley regrouped and found a means to enable her work to evolve dynamically over time. From an art and design perspective, I find soccer jerseys are a tremendous source of inspiration. For new and recent jerseys, subside.co.uk is a great place to scan the latest looks of the world’s clubs. 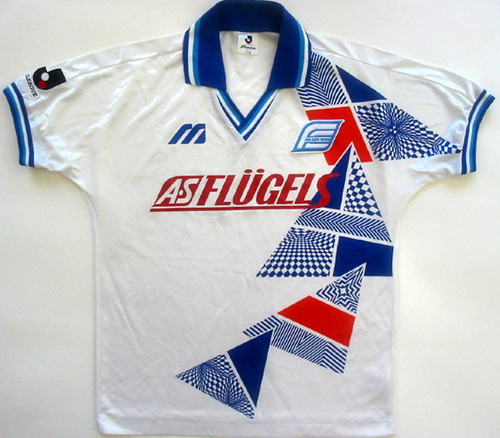 And for vintage shirts, I fancy classicfootballshirts.co.uk; you’ll find hours of eye-popping color combinations and patterns there. 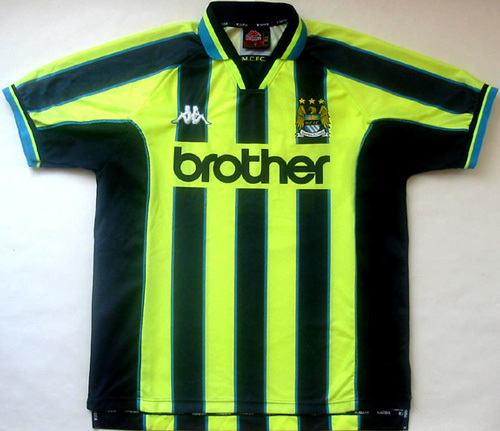 I don’t know where else you’d find the wigged-out, op-art splendor of the 1995 Yokohama Flugels shirt and Manchester City’s 1998 away shirt. Brilliant stuff! To be honest, when considering the massive polarity between line and color found throughout art history—between the Poussinistes and Rubenistes, between Ingres and Courbet—I’ve never taken sides. Perhaps it’s because I’ve never taken a life drawing class (and I have no wish to do so), and my early interest in packaging design. I always thought that a colorful stripe, slashing the pictorial plane, perfectly embodies both approaches. And when I first read about Ingres and Courbet’s vehemence for each other, I found their argument somewhat quaint. Yet, my thinking has evolved considerably of late. For the first three weeks of January, I was immersed in two Verner Panton books: His Vitra Design Museum retrospective catalog and Lidt om Farver (Notes on Colour). The two books have changed how I approach color in my own work; Panton was completely daring in his use of colors, and he shunned white. Since then, I’ve been reading about Bridget Riley, trying to gain more insight into her radical early Sixties op art paintings. I am completely fascinated by these pieces’ startling originality. They blow my mind—and seem to have been generated from nowhere. In 1959, Riley makes a copy of Seurat’s Le Pont de Courbevoie. Two years later, she paints Kiss, and then Blaze I in 1962. Riley’s works from 1961 – 1965 are all achromatic. Quite the opposite, Riley admitted to struggling with color early in her career. Her early paintings aimed for maximum contrast, which is why she chose black gouache on white paper (or white over black ink on plexiglass for her silkscreens). In the early 1960s, Riley chooses to produce work that is “beautifully aggressive.” As she explains in Dialogues on Art, a series of interviews with the artist, “Contrast is the clash of cymbals, the exclamation mark, the strongest possible means. That I wanted; I felt very much at the time like making an extreme statement, of something violent, something that definitely did disturb.” A complete assault on the optic nerve! I’m charging myself with reconciling the aesthetic principles of Panton and early Riley. That’s where my mind is at right now. I want to produce work that perfectly balances line and color. I want to make works that dazzle the optic nerve, transporting the viewer into the fourth dimension. And if I am working with pattern, I will also be employing a sense of intrinsic structure and compositional order. Grant Wiggins is a visual artist who lives in Tempe, Arizona, USA. In this blog, he writes about his newest work, as well as beautiful things that inspire him artistically: hard-edge painting and op art, geometric patterns, bold color combinations, product packaging, and minimal design. Sign up for updates on new work and upcoming shows. © 2018 Grant Wiggins. All rights reserved.